This is my new motto. Living better for less! I am frugal in certain aspects of my life, but they are in areas I feel strongly and politically about -- like clothing. This consumption and demand for new clothes is so high that it contributes directly to sweat shops. Back in the day, when my jeans were ripped, my mom ironed on and reinforced with thread a big patch. Clothes were handed down until they were unwearable. This I believe in. 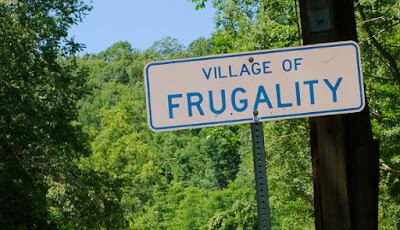 In this way, I am frugal. Other ways? Not so much. I know we could do a lot better with groceries. The extra money we could save could be contributing to my life goal of being debt free and staying that way. I don't want to compromise, though, health and organics in order to be frugal. We want to continue to stay away from processed foods, additives, and such. Surely there is a way to cook and eat healthy, vegetarian, fresh, organic and cheaper than we are now. We don't call it Whole Paychex for nothing! Another potential area is gasoline. We schlep here and there and everywhere. Sometimes we make 2 or more trips into Creve Coeur and back when, in reality, if we spent a little more time planning, perhaps we could have found a better way or at least a cheaper way. The last category is energy. We leave lights on, we leave our computers on, we could use better light bulbs...there are probably more scenarios but I need to thoroughly investigate them. So...here is it. My problem in the past has been lack of energy, stamina and time in the planning part of this. I am going to give it my all -- my sincere try!